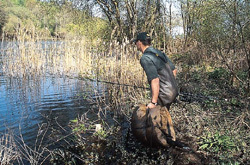 Stalking is one of the most exciting ways of catching carp. Just picture the scene for a minute. It’s a warm afternoon in June and you’ve found a big old mirror carp feeding gently in the edge next to some reeds, over some bait you put in a couple of hours ago. You wait for the fish to leave temporarily before putting your rig in the same spot. After all, you can’t risk spooking it, otherwise you’ll never catch it. Then you sit back and wait, watching the water, hoping the fish will return for another little feed. Sure enough the carp comes back. It resumes feeding and your heart rate reaches very unhealthy levels as you wait to see if it will be fooled by your trap. Then it happens in slow motion. You see the carp actually take your hook bait into its mouth. The fish freezes, its fins bristling as it realises it has a hook in its mouth. Then it panics and bolts. Yes, stalking fish can be mind-blowingly exciting. 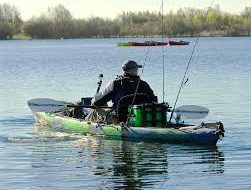 It’s also one aspect of carp fishing that not enough carp anglers actually seem to try, whether you stalk the fish off the top or off the bottom. 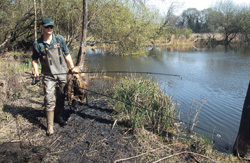 One of the most successful carp anglers in the country, who enjoys specialising in stalking big fish, is Simon Scott. Simon, a lecturer at Sparsholt College near Winchester in Hampshire, has stalked fish to over 40lb from venues as difficult as Wraysbury. His knowledge of the carp as a species, gleaned from many years’ study in fish behaviour, along with his natural fishing ability, means there are few better people in the land to talk about how you stalk carp. For this feature we met up with him by the side of a small syndicate lake he has access to in Oxfordshire. At three acres in size, it’s a beautiful little water, though I was a bit shocked to find out from Simon that it only contained about 30 fish! Wasn’t he making the job of stalking a fish for the cameras a bit hard for himself, I asked? I noticed, too, that the water was far from clear. Although it wasn’t overly murky, spotting feeding fish looked like it might be a bit tricky. Isn’t stalking something that can only be done on clear water fisheries, where you can see individual scales on every fish you are after? “Not at all,” Simon said as he got his gear and bait together. “Although we should see fish today, there are plenty of other signs to look for that will give the location of feeding fish away. With that, Simon prepared his kit by the side of the lake, tying on rigs and getting his bait together. Importantly, he was fishing light, with two rods, a small amount of terminal tackle, a net, scales and a well-padded unhooking mat. “I’m going to leave all my tackle here for the moment,” revealed Simon. “It will be a kind of base camp that I will return to through the day. I hope you’re fit, Jim, as we’re going to be doing lots of walking – I want to do several circuits of the lake. I asked Simon how important baiting up is when you want to do some stalking. 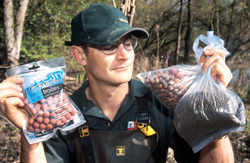 Do you need to bait up in advance, or can you just turn up at a fishery and start stalking fish from scratch? “Baiting up in advance is a big advantage. 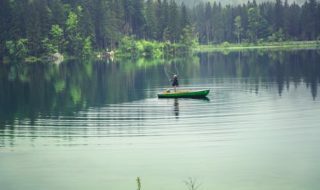 Although not essential, if you can get down to your lake and bait up a number of spots for a few days prior to fishing, your chances of catching will increase,” continued Simon. “I’ve visited this lake twice this week before today, putting a few chopped boilies and pellets in a number of spots. I want to get the fish feeding confidently on my bait and in areas I know I can stalk them. Fish light. This is all the terminal tackle Simon took with him (with the addition of a couple of leads). Instead of carrying a bag around with him, Simon used a pocket on his chest waders to store his terminal tackle. 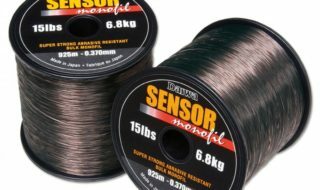 Ensure your spools are loaded with strong line. Simon recommends 15lb Pro Gold and 15lb ESP line. Polaroids are essential. Simon carries two sets – with yellow lenses for dreary conditions and grey lenses for bright days. A peaked cap is also essential. Combined with the glasses, it helps cut out excess glare, allowing you to see into the water. Take plenty of drink with you. You could be doing a lot of walking when stalking – you will need refreshments. Simon also has telescopic rods with him. If he needs to stalk fish under bushes or trees, these help no end. Simon’s bait, net and other kit is carried around inside his large, well-padded unhooking mat to save effort. I also noticed that Simon didn’t have much bait with him. He had one bag of Ocean Fresh’s new Red October freezer bait, a small bag of some home-made fishmeals and about one kilo of pellets. 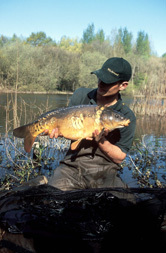 “You don’t need much bait to get carp rooting around on the lake bed and feeding,” said Simon. With the base camp prepared, Simon grabbed his boilies and pellets – leaving his rods behind – and set off around the lake with me in tow. I was soon glad that I brought my chest waders. The circuit of the lake involved wading through deep channels of water, going through bushes and climbing trees. Every now and then Simon slowed down, approaching a spot he liked the look of with immense care. He then watched the water like a hawk, using his Polarised sunglasses, looking for any indication at all that carp might be present. When he was happy it was the right thing to do, he put a couple of handfuls of chopped boilies in, along with a few pellets. Then he was off to the next spot to see if anything was occurring there. What kind of area was Simon looking to fish later in the day? What is the ideal stalking spot, I asked? “Overhanging snag trees, lilies, reed beds and rafts of dead weed and floating scum are four areas I’ll be baiting up today,” he said. “At the top end of the lake are two large overhanging trees. It’s quite deep underneath them and you can’t actually see the fish if they are there, but you know if they’re feeding on the bait as typically they’ll send up great sheets of bubbles. “At the other end of the lake is a small bay. The wind has been blowing in there for a couple of days and it has created a raft of floating dead weed up against some reeds. This is a prime area. I actually fed a carp there a couple of days ago, dropping bait down onto its nose. It started feeding on the bait almost instantly. “Another good option are reed beds. Although it’s early summer, the reeds here haven’t grown up yet, but carp absolutely love them. They provide shelter and good feeding,” continued Simon. “But the best thing about them is they are a tremendous location aid. Watch them carefully and you’ll soon see if carp are in them, as the reeds will knock quite violently as fish swim through them. “There’s one spot on this lake where there’s a small bay next to a reedbed. In the middle of this bay there are two little reed stems by themselves, poking out of the water. What I do is bait up and position my hook bait by these stems – then use them as a float. When a carp is feeding around my rig I’ll know about it because the two stems will knock about and flicker. A take usually follows! Soon Simon located the first fish of the day. It was right in the corner where the scum line was. Although I couldn’t see it, Simon could, and told me what he saw. Because the fish was already having it, there was no need to introduce any more bait. That could risk spooking the common, so Simon simply went scurrying back to base camp to get his rods, tackle, unhooking mat and his net. Back in the corner, we found the fish was still feeding hard. Simon baited up his usual Snake-Bite combi-link with a Red October boilie, then ever so slowly approached the fish – using a tree to give him cover. Within 15 seconds of the bait touching the lake bed, Simon’s rod tip curved round and the fish was on – running powerfully out into the centre of the lake. “It turned right round and took the bait!” exclaimed Simon as the fight commenced. After a fraught scrap where the carp tried to get into the reeds, a common was landed. Job done. One fish was in the net, with the total amount of time that a bait was in the water just 15 seconds! As soon as the common was returned, it was time to move on again. The next spot to stop at was the bay by the reed bed that Simon talked about earlier. When we got there, we stood well back from the edge of the water and just looked at the reeds for 10 minutes. It soon became obvious that fish were in the reeds, so again Simon carefully placed his hook bait right by the two reed stems in the middle of the little bay without introducing any more freebies. After about 10 minutes of waiting, we noticed some reeds in the main reed bed flickering. The movement gradually came towards us. A fish was moving through the reeds towards Simon’s hook bait! Then the flickering stopped. The fish had exited the reeds, heading in the direction of the trap. Events then happened in a blur. The two reed stems by Simon’s bait shook violently, but gave no warning of the mayhem that was about to be unleashed. Stunner… Totally English, totally stalked! The fish took the hook bait and absolutely powered in the direction of the reeds, at a rate of knots. But Simon’s tough kit was well up to it. His size 6 Drennan Boilie Hooks and 15lb Snake-Bite hook links, along with his 15lb ESP main line, all stood firm. The carp thrashed violently around in the edge of the reeds for a few anxious seconds before being persuaded to swim into open water – and a stunning 18lb mirror came to the net. That made it just over 10 minutes of angling and two fish on the bank! Following that capture, it was time to go back to base camp and check the spot under the overhanging snag tree there. Amazingly, tiny bubbles were coming up as something fed over the bait Simon had introduced. 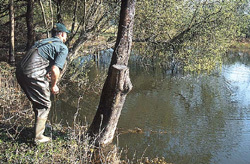 Could it be a carp – or was it a tench? The answer was emphatically answered 10 minutes later when another upper double mirror was brought to the net, and Simon had demonstrated in a short time how to stalk fish you can see, how to stalk fish using reed beds as indicators and how to stalk bubbling fish you can’t see. It was an awesome display of angling. In total, Simon’s baits had been in the water for just over 20 minutes. We’d been at the lake for three hours or so, with the rest of the time spent watching and baiting. Yes, stalking is an exhilarating form of fishing. And as you can see, it can also be a very productive form of fishing. So why not give it a go yourself this summer?